An autumn bicycle ride, east of Amsterdam. In the fall we often have long periods of quiet dry weather with mild temperatures. September and October, and sometimes even deep into November can still be just great for bicycle day trips. Last Saturday, early November, it was one of these lovely days. 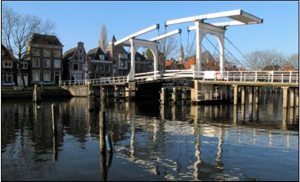 In the afternoon, I cycled out of Weesp over the old river Vecht bridge. Followed the winding stream along the windmills for a couple of kilometers. Then east through a stretch of low grasslands. A polder along national park Naardermeer. Almost no wind today. But when planning a bike trip in Holland, take the wind direction into account. Nice to have backwind on these open plains. It's still good grazing here for thousands of wild geese. There's plenty of birdlife year round anyway, like that colony of cormorants that settled nearby. After the polder, you enter the woods. In full autumn colours now. With millions of mushrooms covering the forest floor. In the woods as well, plenty of bicycle paths. Always great fun to cycle here. Back in the lowlands. Peatland, with many ponds and lakes. Like in the woods, there's already a different, muffled sound in nature. You can sense winter is coming, even though today I could take off my coat after a few miles. Rolling into Weesp, a nice sunset for dessert. There's a short video clip on YouTube, with a couple of shots of this bike trip. Click here for Bicycle Day Trips info. Or simply click here for NEXT photo page (Amsterdam pictures).